It would only be a matter of time before my iPod was sleeping with the fishes. That was the conclusion I came to during the summer of 2002. Yes, sleeping with the fishes, but not in the "Luca Brasi rubbed out by a rival mob family" kind of way. I meant literally at the bottom of some body of water. 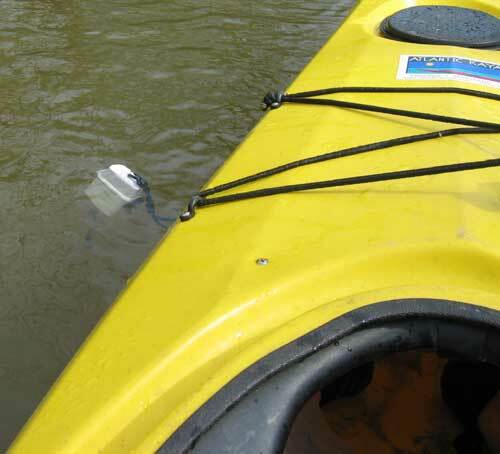 You see my iPod had become a delightful companion while kayaking. Sea kayaking for those of you keeping score. I've gotten into the habit of listening to my iPod any time I'm paddling alone. Unfortunately I haven't had much in the way of protection for the little musical passenger. Sometimes I'd pop the iPod into a zip lock bag and I'd often wear a spray skirt but neither provides much in the way of protection for the iPod should I have to exit the kayak while capsized. I knew what I needed was some sort of watertight enclosure for my iPod. I had seen some enclosures that were designed for weather radios or generic technology (a cell phone, PDA, etc). Most of those enclosures didn't have a way to connect headphones and use my iPod while it was inside the waterproof container. Obviously that was a requirement. I didn't want to just transport the iPod securely, I wanted to listen to the cute fella. So I was more than a little excited when earlier this year I read about the Lilipod (http://www.lilipods.com/). This watertight enclosure was designed specifically for the iPod. I ordered one right away. The first thing you notice is that there's an audio jack that hangs off the bottom of the Lilipod like a rubbery tail. You insert an iPod into the Lilipod upside down, plugging the iPod into the audio plug inside the case. Then you close the Lilipod and use the latch to insure the top of the case is firmly closed against the gasket in the bottom of the case. Plug in your earphones to the audio jack in the rubbery tail and you are done. It's worth noting that there's foam inside this hard plastic shell. I would expect that an iPod could survive a significant fall while in a Lilipod but I'm not planning on finding out one way or the other. A down side to using the Lilipod is that there's no way to connect the third generation iPod's wired remote control. Consequently you need to start your iPod, push it down into the Lilipod, adjust the volume to your liking and then close the Lilipod. If you'd like to skip a song, or adjust the volume you'll need to open up the Lilipod thus exposing your iPod to the elements. Personally I don't see this as a deal-breaker but it would have been nice to use the wired remote that came with the iPod. So it may be watertight but does it float when it's loaded to the gills with 40 gigabytes of paddle-moving music? I knew the family saying, "keep your friends close but your iPod closer" but I had to do a real world test. With this article in mind I nervously put my fully loaded Lilipod overboard in Piscataway creek to confirm it's buoyancy. Yes, it floats, but barely. If you taste in music runs more towards heavy metal you might need to be a little more careful than most. The Lilipod comes with a built in belt clip and a lanyard. I found an iPod loaded Lilipod to be a bit too heavy to comfortably wear around my neck with the lanyard but the belt clip works well. My PFD (personal floatation device, what, in less litigious times, we used to call a life preserver), has a roomy pocket in the front that accommodates the Lilipod. Conveniently the pocket has a grommet at the bottom to allow water to drain out of it if I were to take a swim. This grommet makes a nice place to run earphone cables through. It's worth noting that the earphones that Apple ships with the iPod are not waterproof but waterproof earphones are available. 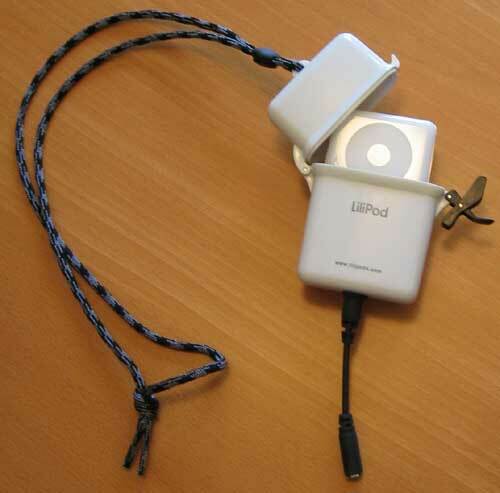 There is a Lilipod available for the first and second-generation iPods as well as one for the third generation (dock connector) iPods. When this article went to press, both models cost $39.99. At that price, it was an offer I couldn't refuse.